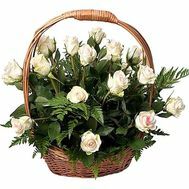 Baskets of roses - this is a beautiful and gallant gift, able to turn the world of the one to whom you present it. 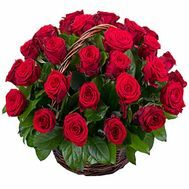 Roses are charming and beautiful in themselves, and for many years, and even centuries, have conquered the hearts of all people on the planet. 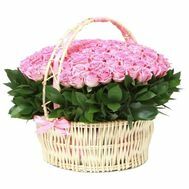 And if you put roses in a beautiful, wicker basket, picking the right and the right combination of colors for you - then this present will not be equal at any celebration! 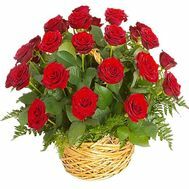 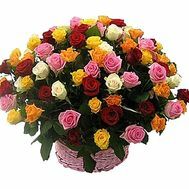 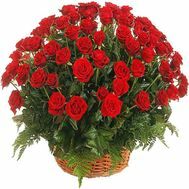 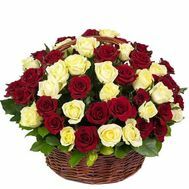 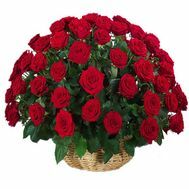 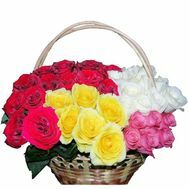 A basket of roses is something that will help you make a normal, in general, gift, more romantic and more pleasant. 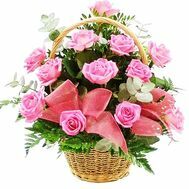 Especially if you make delivery by courier from our store so that in a couple of hours the recipient or recipient beamed with smiles to the whole city. 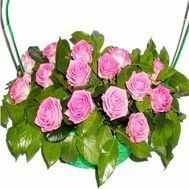 In our online flower shop you can find a special catalog filled with a huge variety of commodity items. 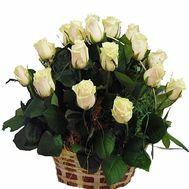 In it there is everything that will help to decorate any day and that it is possible to present absolutely for any holiday without exceptions. 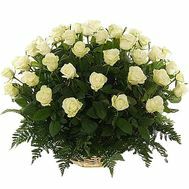 Our florists recommend paying attention to white roses. 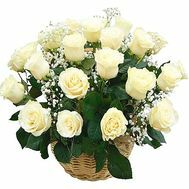 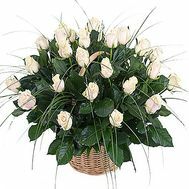 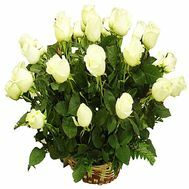 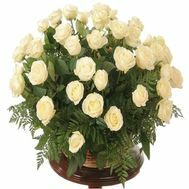 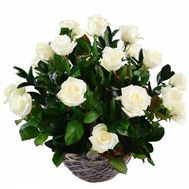 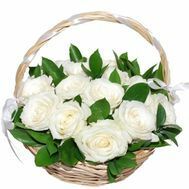 To buy white roses in a basket means to present not so much a gift as a symbol of your attention and care impregnated with tenderness and modesty. 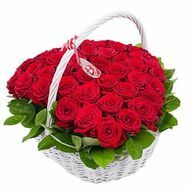 Such a present will perfectly fit on the anniversary of relations and even weddings - the purest and brightest holidays in the life of everyone. 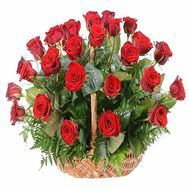 Also we offer you a basket of red roses. 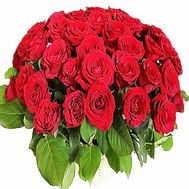 The red color of roses, as is known, emphasizes the passion and desire in the relationship, and therefore it is not surprising that they should be given to people beloved and important. 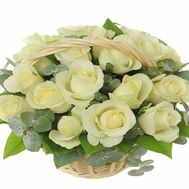 For example, beloved wife on February 14, as a symbol of your unswerving love and strength of your connection. 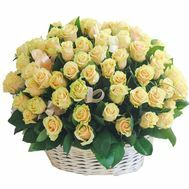 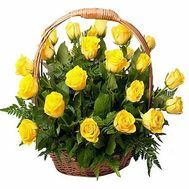 Among our assortment there is also a basket with yellow roses - a sunny and spring gift, bringing joy and pleasure from contemplation to each person. 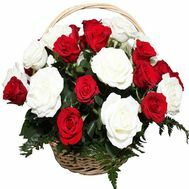 In addition to baskets that differ in color, you can buy a basket of 101 roses - the most luxurious and sensual gift, which is difficult to find equal. 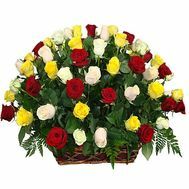 We provide various color combinations with roses, as well as vary their quantity. 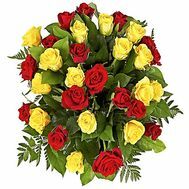 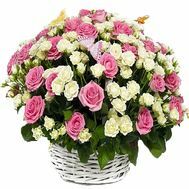 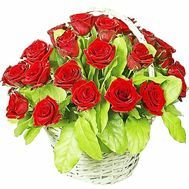 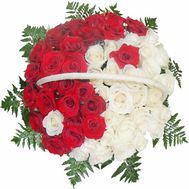 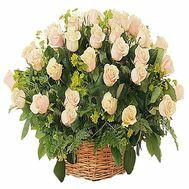 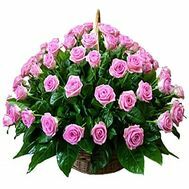 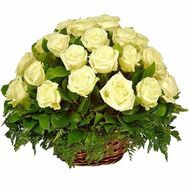 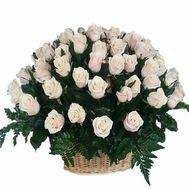 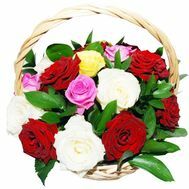 Thanks to this you can order a basket of 51 roses with delivery at any time..
Our online flower shop is the best friend of couples in love, strong Ukrainian families and business partners. 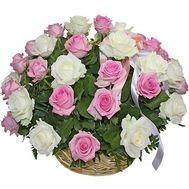 We always have the largest flower assortment and friendly managers who are ready to come to your aid, in case you are at a loss to choose a gift. 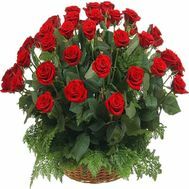 Therefore, if it comes to buying the most beautiful flower bouquet of roses - they turn to us. 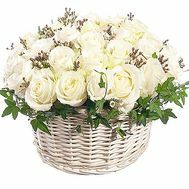 Only here you can always add a gift to the bouquet (sweets, toys, alcohol, etc. 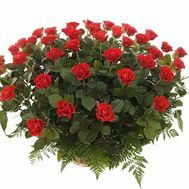 ), as well as take part in various promotions that we hold for our customers. 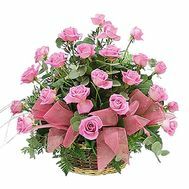 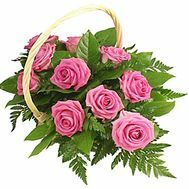 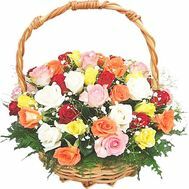 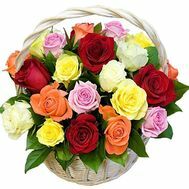 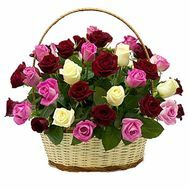 Here you can order a basket with a rose bush with delivery anywhere in the country. 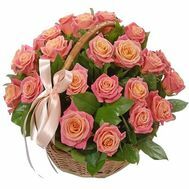 Imagine the surprise of your beloved, who lives thousands of kilometers away from you, and which suddenly receives such a wonderful present. 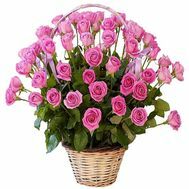 The moments of happiness are guaranteed to her!